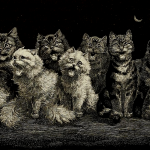 These copyright free vintage drawings of cats and kittens may only be in black and white but they still capture the curious charm of the feline. 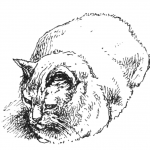 Many of these cat drawings could be easily colorized or left in their original state. If you are looking for an interesting black and white illustration of cats or kittens, you may have just come to the end of your search. Fez is such a pretty and stately looking cat. 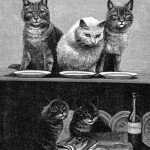 This vintage white sitting cat drawing is in the public domain and free to download from Reusable Art. A whole cat chorus howling at the moon. Super cool reverse image with light lines on a dark background. 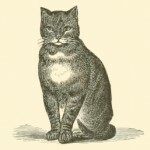 Vintage white cat drawing from 1892. A fine example of a white Persian cat. A great black and white drawing by Harrison Weir (1824-1906). He is called the Father of Cat Fancy. But, to this pretty silver tabby cat may have called him Daddy. 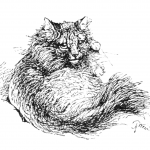 Weir’s Old Lady was part of his book about cats. Muff was the inspiration for this lovely fluffy cat drawing by Harrison Weir. 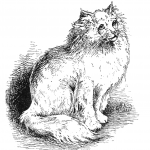 She was a lovely white Persian who was part of his famous book all about cats. Made up of primarily little lines, simple cat drawing by Harrison Weir with so much detail and personality. Like all of his work, it’s in the public domain. 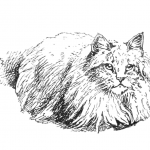 Vintage white Persian cat drawing by Harrison Weir (1824-1906). 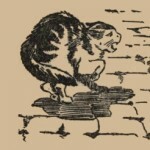 A lovely cat caught in the middle of washing his face from an 1892 book by Weir. Two of my favorite things; cats and the artwork of Harrison Weir. 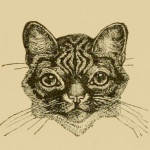 Sweet line drawing of a tabby cat’s face from his book all about cats. 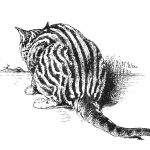 Drawing of a fierce-looking little striped kitty. 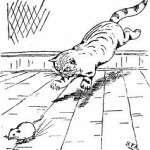 Vintage drawing of a mouse escaping a cat. 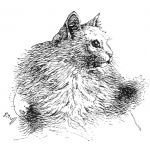 Public domain black and white cat drawing from 1882. Fun drawing of 5 cats and a fish.